Jamón ibérico “Iberian ham”, also called pata Negra and carna Negra “black hoof” is a type of cured ham produced mostly in Spain, but also in some Portuguese regions where it is called presunto ibérico. According to Spain’s Denominación de Origen rules on food products, the jamón ibérico may be made from black Iberian pigs, or cross-bred pigs as long as they are at least 75% ibérico. The black Iberian pig lives primarily in the south and southwest parts of Spain, including the provinces of Salamanca, Ciudad Real, Cáceres, Badajoz, Seville, Córdoba(Denomination of Origin Los Pedroches) and Huelva. It also lives in the southeast parts of Portugal (Barrancos), where it is referred to as porco de raça alentejana. Immediately after weaning, the piglets are fattened on barley and maize for several weeks. The pigs are then allowed to roam in pasture and oak groves to feed naturally on grass, herbs, acorns, and roots, until the slaughtering time approaches. At that point, the diet may be strictly limited to olives or acorns for the best quality jamón ibérico, or may be a mix of acorns and commercial feed for lesser qualities. In particular, the ibérico hams from the towns of Guijuelo in the Salamanca province and Jabugo in the Huelva province are known for their consistently high quality and both have their own Denominación de Origen. Almost the entire town of Jabugo is devoted to the production of jamón ibérico; the biggest producer is 5J Sánchez Romero Carvajal. The town’s main square is called La plaza del Jamón. • The finest is called jamón ibérico de bellota (acorn). This ham is from free-range pigs that roam oak forests (called dehesas) along the border between Spain and Portugal, and eat only acorns during this last period. 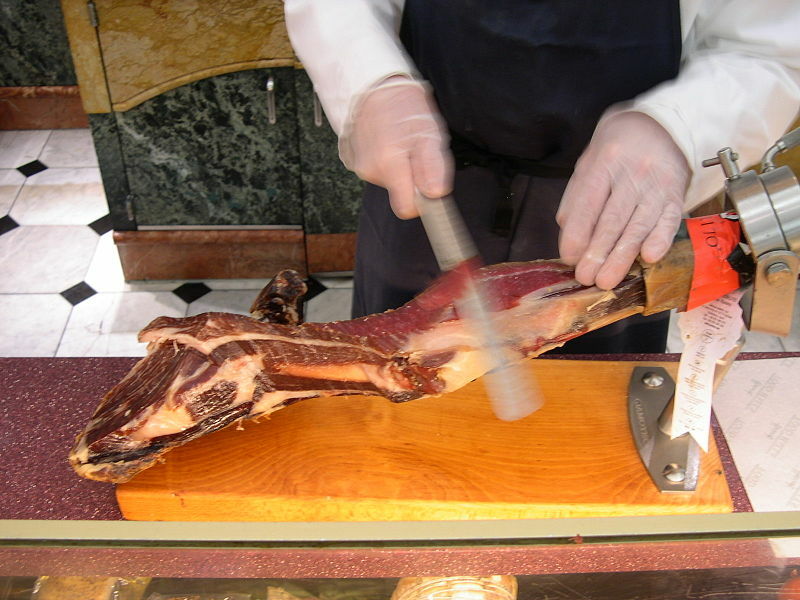 It is also known as jamón ibérico de Montanera. The exercise and diet have a significant impact on the flavor of the meat; the ham is cured for 36 months. • The next grade is called jamón ibérico de recebo. This ham is from pigs that are pastured and fed a combination of acorns and grain. • The third type is called jamón ibérico de cebo, or simply, jamón ibérico. This ham is from pigs that are fed only grain. The ham is cured for 24 months. Additionally, the word puro (pure, referring to the breed) can be added to the previous qualities when both the father and mother of the slaughtered animal are of pure breed and duly registered on the pedigree books held by official breeders. The term pata negra is also used to refer to jamón ibérico in general, and may refer to any one of the above three types. The term refers to the color of the pigs’ nails, which are white in most traditional pork breeds, but black for the Black Iberian breed. While as a general rule, a black nail should indicate an Ibérico ham, there are cases of counterfeits, with the nails being manually painted. Jamones de bellota are prized both for their smooth texture and rich, savory taste. A good ibérico ham has regular flecks of intramuscular fat. Because of the pig’s diet of acorns, much of the fat is oleic acid, a monounsaturated fatty acid that has been shown to lower LDL cholesterol and raise HDL cholesterol. 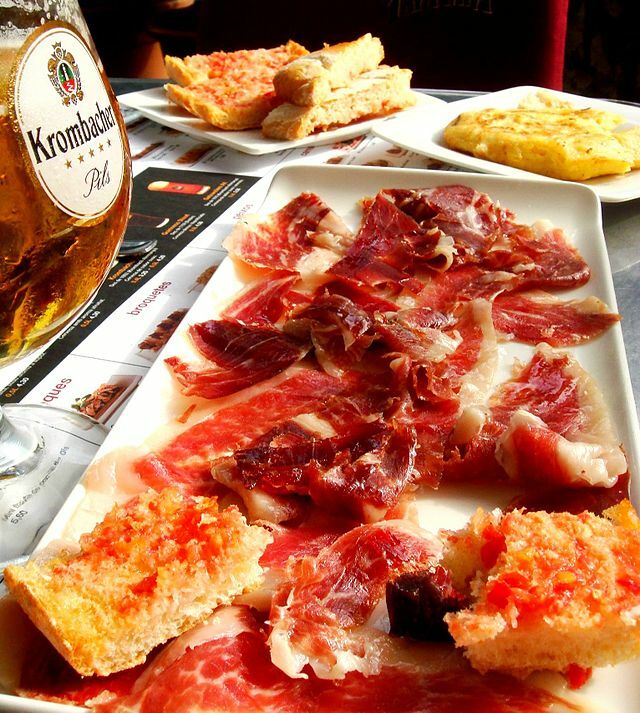 Until recently, jamón ibérico was not available in the United States (a fact referenced in the movie Perdita Durango, where the ham ofJabugo is praised as “illegal, but delicious”). Prior to 2005, only pigs raised and slaughtered outside of Spain were allowed to be processed in Spain for export to the United States. 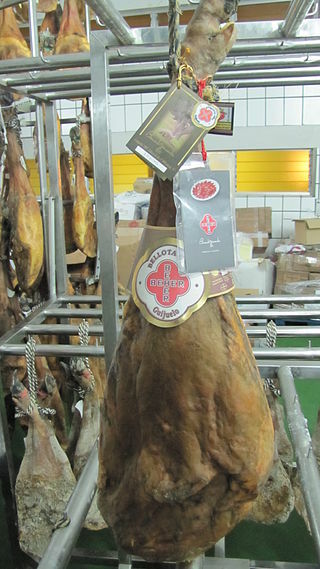 In 2005, the first slaughterhouse in Spain, Embutidos y Jamones Fermín, S.L., was approved by the United States Department of Agriculture to produce ibérico ham products for export to the United States. The first jamones ibéricos were released for sale in the United States in December 2007, with the bellota hams due to follow in July 2008. The basic jamón ibérico is priced upwards of $80 a pound, and the bellota is priced upwards of $99 a pound, making these hams some of the most expensive in the world. This entry was posted in food and tagged Best Iberico in Miami, Gourmet deli, Gourmet miami, Iberico ham.